Clothes feel scratchy, hugs are shrugged off - coping with sensations can be a problem, but is it a disease? Ana can sit on the couch for only about five minutes before it’s time to move. First she rides her bright blue unicycle a few times around the dining room table. Then she gets on a swing hung from the doorway and pumps until her feet can touch the ceiling. A few minutes later she’s doing laps around the table on her RipStik - a skateboard-like balance board. Then she runs outside and climbs the back fence (more fun than going through the gate), to jump on a trampoline. After mastering a flip, she manages to climb back into the house through an open window. Life with Ana, who turns 11 this month, is action-packed. The fifth-grader has sensory processing disorder - her brain doesn’t process information from her five senses in a typical way - leaving her unable to sit still (her muscles just have to move), wear socks (they’re too irritating), concentrate in a busy classroom (so much to look at and hear), or be in the same room with a hot pizza (the aroma is overpowering). “You know when you wake up in the morning, if you don’t have your coffee and your car doesn’t work and you get to the office and someone’s given you a new project that’s due today instead of tomorrow - that’s what it’s like for these kids every day,’’ her mother, Pauline Pimlott, said. Getting help for such kids can be tough. Insurance often won’t pick up the tab, because sensory processing disorder isn’t officially recognized by the American Psychiatric Association, which writes the definitive manual on disabilities such as autism, dyslexia, and attention-deficit hyperactivity disorder. Ana has received specialized occupational therapy on and off for years, but at $175 an hour, it’s too expensive to do often, her mother says. Now, a group of researchers, families, and occupational therapists is aggressively lobbying to get sensory processing disorder included in the next edition of the association’s Diagnostic and Statistical Manual of Mental Disorders, which is currently being drafted. Eleven other conditions are being considered for inclusion as well. It’s difficult to get any new disorder added to the manual, but particularly one that affects everyone differently and is similar to other conditions. Those characteristics also make it tough to estimate how many people may be affected by sensory processing disorder. “All of us interpret pain or discomfort in different ways - how do you measure somebody’s feeling?’’ asked Dr. Margaret L. Bauman, an associate professor of neurology at Harvard Medical School. Bauman, an autism expert, said researchers led by Lucy Jane Miller of the Sensory Processing Disorder Foundation, in Greenwood Village, Colo., have solved that problem by beginning to measure physical responses to stimuli - how much a child’s heart rate rises when exposed to a busy place, for instance. 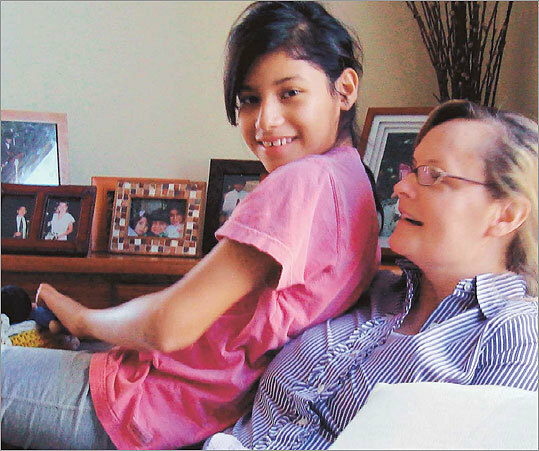 Ana’s mother says there’s no question Ana has a real medical problem that substantially affects her daily life. Her two younger siblings are both free of the disorder, said Pimlott, who worries about how Ana will cope as school work and social pressures mount in middle school. “To do a half hour of homework could take an hour and a half,’’ Pimlott said. That’s pretty typical for a child with sensory processing disorder, according to Jane Koomar, president of Occupational Therapy Associates-Watertown, the private practice where Ana gets her therapy. Sometimes, this kind of fidgetiness, overreaction to stimuli, trouble with transitions, and strong opinions about things like wearing socks are seen as bad behavior - that the child is being obstinate or willful. Then, Koomar said, “not only is the underlying neurological cause not being treated,’’ but resources may be spent treating the wrong problem - often with drugs to address hyperactivity or psychotherapy to reduce frustration - which can make matters worse. Getting a diagnosis can help parents better understand their child’s distress, she said, and make it easier for them to address the child’s true needs. Sensory processing disorder is a continuum, with some people having mild versions - maybe they avoid noisy parties and shopping malls - and others so disabled that they can’t hold a pencil, take a bath, or tolerate many foods. Some people with sensory processing disorder have no concept of their bodies in space. They are clumsy and bad at sports, and have trouble driving or pouring drinks. They can seem aggressive - not realizing how hard they are hitting playmates during roughhousing, for example. Occupational therapy for children like Ana includes swinging, bouncing, bike riding, and other play-oriented activities intended to provide a sensory “diet’’ that meets her needs, but doesn’t overstimulate her. Alice S. Carter, a psychology professor at the University of Massachusetts Boston, doesn’t think the evidence is quite there yet to support adding sensory processing to the official list of developmental disorders. But she would like to see it added to the “experimental’’ section of the manual, where it would receive more research funding, and where insurance companies and pediatricians would be more likely to acknowledge it as a legitimate problem. “I started off really believing no, I don’t know why we need another disorder; it’s going to add to confusion,’’ Carter said. But then she began a long-term study of more than 1,000 children growing up in and around New Haven. She said she saw children with symptoms that were incredibly disruptive but not well described by any other disorder in the manual. And she said she saw parents spend considerable sums on treatments whose effectiveness had not been proven. David Pauls, a professor of psychiatry at Harvard Medical School, agrees that including sensory processing disorder in the experimental section of the manual would encourage much-needed research. Pauls, also director of a Psychiatric and Neurodevelopmental Genetics Unit at Massachusetts General Hospital, is now studying the links between sensory processing disorder and Tourette’s syndrome, obsessive-compulsive disorder, and attention-deficit hyperactivity disorder. It’s known that many of these syndromes overlap with each other and with autism - so much so that some people question whether sensory processing should be its own disorder or considered part of one of the others. It’s precisely children like Ana who argue for labeling sensory processing its own disability - because her symptoms don’t fit neatly into any of these other categories. She is sweet and warm, quick to grin, talkative and articulate. She cuddles with her mom on the couch. She shakes hands with a stranger and easily makes eye contact. She calms down after she burns off some energy, and doesn’t seem antsy. She just has to move, and needs constant help from adults to minimize distractions and help her cope with a world that often seems threatening. Then, her ideal school might include more than just gym class.